Not only is China accumulating alot of wealth, China is also accumulating Arms too. In its annual report on military forces around the globe, the Stockholm International Peace Research Institute (SIPRI), International arms sales have grown since 2002, with China and India being the biggest importers and the U.S. and Russia the two major exporters. 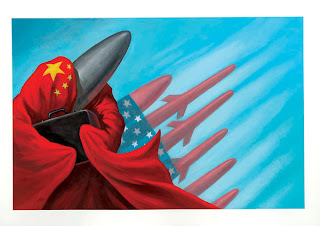 The United States remained the world's biggest military spender last year, devoting about $529 billion to arms, while China overtook Japan as Asia's top arms spender. China's growing military expenditures reached nearly $50 billion, making it the fourth biggest arms spender in the world and Japan was fifth with $43.7 billion. Sometimes I wonder with so much wealth accumulated and so much more money spent on national security, how come China isnt doing enough to improve national healthcare and education in this country. I always thought that the welfare of the people must come first. With good education and good healthcare, China will be well positioned for the future.